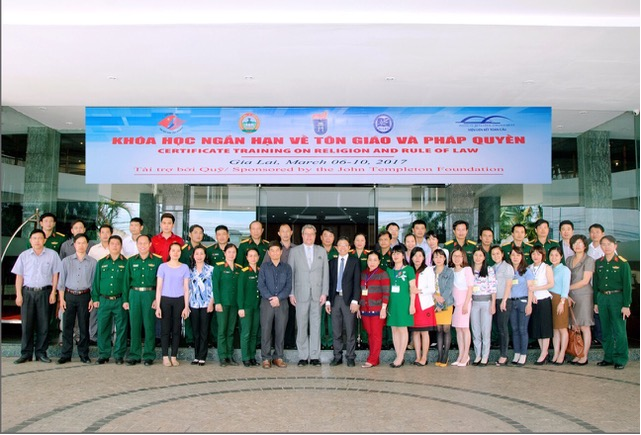 From 7 to 10 March 2017 the Institute for Global Engagement (IGE), in partnership with the Vietnam National University’s University of Social Sciences and Humanities and Brigham Young University’s International Center for Law and Religion Studies, conducted a “Religion and Rule of Law” (RROL) certificate program in Pleiku city, Gia Lai Province, Vietnam. This was the sixth RROL program that IGE has conducted in Vietnam, and the first program held in Vietnam’s Central Highlands, a region that has faced decades of ethnic and religious tensions. The four-day training program focused on good governance and religion; religious rights; international standards of religious freedom; religious freedom in Vietnam; and the implications of Vietnam’s new law on religion and belief that was ratified by Vietnam’s National Assembly in November 2016. Participants included scholars, government officials, policy advisers, and military personnel working with ethnic and religious minorities from 6 provinces. The majority of participants hailed from the Central Highlands regions. In total, 69 participants completed the training. Participants found the training both informative and applicable to their work. As one participant noted, “The training is very effective and practical. It raises awareness about law and religion so participants can apply it to research, work, and daily life.” The training also raised awareness among participants about international human rights and comparative models of governance and religion. Lectures were given by American, Singaporean, and Vietnamese experts on religion and rule of law and international religious freedom. Vietnamese lecturers included policy makers, policy advisers, government officials working on religious affairs at Vietnam’s central and provincial levels, and alumni from the previous RROL trainings in Vietnam. Through the diverse scholarship and experiences presented by the lecturers, training participants gained knowledge and understanding of both research and theories about good governance and religion as well as actual case studies on this issue from various countries and other provinces in Vietnam. The training also introduced research and case studies on religion and economics, making the argument that greater religious freedom and social harmony can contribute to business and improve the economy, both within a society and between nations. This 2017 program in the Central Highlands builds on IGE’s decade-long engagement in Vietnam and is part of a training series that seeks to build capacity of emerging Vietnamese scholars, policymakers, and officials to advance religious freedom and rule of law in Vietnam. From 2012 to 2015, IGE and its Vietnamese and American partners conducted four RROL certificate programs in Hanoi (2012 and 2015), Ho Chi Minh City (2013), and Da Nang (2014). In 2016, IGE and its partners conducted the first RROL certificate program in a rural area in Lao Cai Province, which is located in Vietnam’s Northwest Highlands. These programs have resulted in not only local scholarship but also a growing network of like-minded reformers who are making religious freedom and rule of law regular topics of study and practice at academic and government institutions across Vietnam. The 2017 Vietnam Central Highlands Religion and Rule of Law certificate program was made possible with the generous sponsorship of the John Templeton Foundation. About the Institute for Global Engagement – The Institute for Global Engagement is an innovative nonprofit organization working for conflict resolution and religious freedom worldwide through relational diplomacy. Through local partnerships, IGE works transparently to convene, connect, and build consensus among government, religious leaders, and scholars to ensure that people of all faiths and none have full freedom of conscience and can participate as equal citizens in public life. To learn more about IGE’s work in Vietnam, please contact Hien Vu at hvu@globalengage.org.